Easterseals Southern Georgia is currently looking for dedicated individuals to become a home provider for children or adults with disabilities. Host homes or life sharing arrangements are a part of the services we provide. Cody has always wanted to become a firefighter. 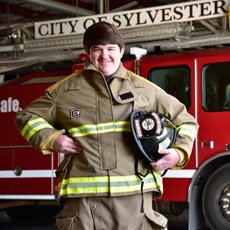 With the help of Easterseals, the Sylvester Fire Department, a lot of hard work and determination, Cody is now a Registered Firefighter. Family Support is a broad based category that serves children and adults, ages 3 and up, who have intellectual/development disabilities and autism. The goal of family support is to keep families together, until the individual with a disability chooses to live independently. Below is a list of frequently asked questions and answers we hear at Easterseals. If you have another question or would like to request more information about Easterseals, feel free to use our online form to contact us. Thanks for your interest! As America’s largest nonprofit health care organization, Easterseals is committed to the comprehensive health and wellness of the more than 1.5 million people it serves each year and is prepared to respond to the needs of the one in four Americans living with disability today with outcomes-based services for all disabilities throughout the lifespan. Among our services: early intervention, inclusive childcare, medical rehabilitation and autism services for young children and their families; job training and coaching, employment placement and transportation services for adults with disabilities, including veterans; adult day services and employment opportunities for older adults – in addition to a variety of additional services for people of all ages including mental health and recovery programs, assistive technology, camp and recreation, caregiving support including respite – and much more. Additionally, we’ve served transitioning military, veterans and their families and caregivers since WWII and continue to be the “go to” resource for them to help ensure their successful transition to civilian life. Connect with your local Easterseals to see what services are offered near you. No. We serve a wide range of disabilities, both visible and invisible. Across the nation, we remove physical, cultural, attitudinal and legal obstacles so people with disabilities have every opportunity to live meaningful and productive lives, on their own terms. We exist to provide the best services and opportunities for people with disabilities in communities nationwide. More than one million people benefit from Easterseals services across a network of 71 affiliates in communities nationwide. Additionally, Easterseals helps more than 100,000 physicians, therapists and other professionals learn ways to improve services for people with disabilities through professional education programs. To make our services accessible to as many people as possible, Easterseals relies on public contributions. Public contributions help cover the difference between actual program costs and what our clients can afford. Easterseals is a Section 501(c)(3) organization that also receives funding from a variety of other sources, including private insurers, government agencies and fee-for-service. Easterseals exceeds all of the Standards for Charity Accountability set by the BBB Wise Giving Alliance. Find out how you can help us take on disability and continue to provide indispensable resources. What does my donation to Easterseals support? As a national non-profit organization with a federated structure, Easterseals financial profile is represented correctly only when the national headquarters (Easterseals, Inc.) and its 71 affiliate organizations are shown in a consolidated whole. By nature, Easterseals, Inc. is meant to be more administrative and exists largely to support our 71 affiliates by efficiently building brand, philanthropy and advocacy to benefit our whole organization. Whereas, our 71 affiliates are in hundreds of communities, providing direct services and programs, and making a profound difference in people’s lives every day. As a whole organization, nearly 90% of our funding is invested in programs and direct services nationwide. Easterseals, Inc. is proud to put your donations to work effectively by investing nearly 80% of Easterseals, Inc.’s funding in our programs and services, 17-18% in fundraising efforts and the remaining 4% is used for administrative and management purposes. Today and every day, Easterseals offers positive and profound programs and services to more than a million people and families living with a disability annually. Our unique, inclusive services are provided through a network of 71 affiliates in communities nationwide, plus four international partners in Australia, Mexico, Puerto Rico and Canada. Easterseals offers hundreds of home and community based services and supports. No. Easterseals is not affiliated with any religion and does not discriminate. At the core of the Easterseals organization is a common passion for caring, shared by our staff, volunteers and by those who support our mission. Easter "seals" are stamp-like seals that were first created in 1934 to raise money for services benefiting children with disabilities. Then known as the National Society for Crippled Children, the organization was re-named "Easterseals" in 1967, reflecting the public's awareness and acceptance of the campaign. Yes. In fact, Easterseals mails seals to more than 19 million households across the country every year, raising over $13 million to support services to people and families with disabilities. Easterseals' continued success in providing services to people with disabilities would not be possible without volunteers! Your time, energy and heart will inspire and touch the lives of those we serve. Your personal commitment enhances the services we provide to our clients nationwide. Search for a volunteer opportunity in your area.